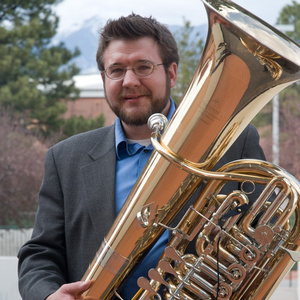 Guest artist Alex Lapins, tuba, will present a master class. This event is free and open to the public. Alexander Lapins teaches at the University of Tennessee School of Music. During the summer he also teaches at Blue Lake Fine Arts Camp. Dr. Lapins previously taught at Northern Arizona University, the University of Indianapolis, Indiana State University, Indiana University, the University of Michigan All-State Program at Interlochen, Detroit Symphony Civic Orchestra, and French Woods Fine Arts Camp. Dr. Lapins has appeared as a soloist with orchestras, concert bands, and chamber groups. He has performed throughout the United States, China, South America, and Europe. A diverse performer, he is the only tubist to have won fellowships at both the Tanglewood Music Center and the Henry Mancini Institute. For several years Dr. Lapins performed as principal tubist of several professional orchestras and brass quintets throughout Indiana, and was a first-call substitute/extra musician with the Indianapolis Symphony Orchestra and Indianapolis Chamber Orchestra. He has also performed with the New Mexico Philharmonic Orchestra, Charlotte Symphony Orchestra, Charleston Symphony Orchestra, Chicago Symphony Orchestra, Cincinnati Symphony Orchestra, Cincinnati Opera Orchestra, Roanoke Symphony Orchestra, Knoxville Symphony Orchestra, and the Flagstaff Symphony Orchestra. Dr. Lapins has also performed with the Disney Collegiate All-Star Band, the Guy Lombardo Orchestra, the New Sousa Band, and Harvey Phillips' Tubacompany. He also has extensive experience as a first-call studio musician. Dr. Lapins has been featured at regional and international ITEA conferences, United States Army Band Tuba Workshops, the 2012 Southwest Horn Workshop, and the 2012 International Women's Brass Conference. In 2011 he hosted the Southwest Regional ITEA conference at the NAU School of Music, and in 2016 he hosted ITEA's International Tuba/Euphonium Conference at UT. He has presented guest recitals and master classes at many schools of music. Alexander Lapins has graduate degrees in music performance from Indiana University and the University of Michigan, and a bachelor's degree in music industry from James Madison University. His principal teachers include Daniel Perantoni, Fritz Kaenzig, Kevin Stees, Tony Kniffen, and Mike Bunn. He has also studied with Gene Pokorny, David Fedderly, Jim Self, and Mike Roylance. Alexander Lapins is a Miraphone Artist and an Eastman Artist.